The northwest provinces of Jujuy and Salta are a bit off the beaten track. Argentina offers so many different landscapes that it can be very hard to decide which you'll choose for your short trip and most end up in Patagonia, Mendoza or Iguazu. I suggest you add a visit to the north to your Argentina itinerary. We went on an epic 9-day Argentina road trip across Jujuy and Salta and I don't think I've ever seen anywhere so beautiful. This post is a breakdown of our Jujuy and Salta road trip itinerary: the route we drove, where we stayed as well as options if you have more time to spend than we did! January and February bring crowds and rain. If you want to do a road trip here, avoid driving yourself during the rainy season. A lot of roads become impassable, mountain passes such as Abra del Acay would be out of the question. Fording the creeks (now rivers) that flow over the roads on your way to Iruya will require a lot of skill (more than I have!). January and February are summer holidays for Argentina and while this area is off the beaten track for foreigners, it isn't with the locals. It will be very crowded. Semana Santa (the week leading up to and including Easter) is very busy. This is an extremely devout area of the country and it's famous for it's Easter celebrations. If you're visiting for Semana Santa, reserve ahead of time to be sure you get a bed. Same goes for Carnival. We went in May and the weather was perfect. We were blessed with sunny days every day. The afternoons were ideal at 17-20 degrees Celsius (60-70'F), we were in shorts and t-shirts more afternoons. At night, temperatures plunged and we were bundled up in sweaters. I loved the cold nights in the mountains with their hearty, warm food and cozy, adobe homes. You'll need to fly from Buenos Aires to either Jujuy or Salta. We flew into Martín Miguel de Güemes International Airport in Salta (airport code: SLA) and drove straight to Jujuy from there. If you're flying into Salta, check rates here for rental cars from SLA. It would have made more sense for our itinerary to fly into Jujuy's airport. However, it was cheaper to fly into Salta. The drive from Salta to Jujuy added only a couple hours to our day and it really was a beautiful drive through a lush, green valley. The Jujuy airport is Gobernador Horacio Guzmán International Airport in San Salvador de Jujuy (airport code: JUJ). If you're flying to Jujuy, check car rental rates here. If you're backpacking in Argentina, this is a common route to connect Bolivia to Argentina. You'd cross from Bolivia into Argentina in La Quiaca, then work your way south through Jujuy then Salta and onwards (or vice-versa). This exact itinerary wouldn't suit that route (since it's a loop through the region beginning and ending in Salta) but the advice on the region still holds. Enjoy the drive. If you're focused on the destination and not enjoying the journey, you're missing the point. Every bit of highway had something new to offer. The landscapes changed drastically throughout the drive, the small towns we visited along the way, the wildlife (llamas! ), and more. Enjoy your time on the road, don't rush through it to get to your destination. This is your destination. Do you need a 4x4? It would be helpful but we didn't have one. I rented the cheapest option available, as I tend to do, and we were fine. But would it have been easier with a 4x4? YES. A lot of the roads we took were dirt roads and our little Chevy Joy didn't have great traction. We also had to cross so many creeks that ran over the road that I lost track, and they were scary with our little car. If there'd been more rain recently, it would have been impossible. Don't pick up hitchhikers. We actually didn't see any, but a neighbor offered us this piece of advice that was given to him by a border control agent while he was driving in Jujuy. The agent said many of the young women you see hitchhiking at drug mules coming into the country from Bolivia. They'll hitch a ride, but if you go through one of the regular police checks, they'll leave the drugs in your car and jump out, leaving you to take the blame. I'm not sure if this is accurate, but it wouldn't hurt to keep in mind! We've all seen how Brokedown Palace ended. Don't look at the kilometers, ask how long it will take. Google Maps may tell you an hour and a half, but a local will tell you four hours. Listen to the local! A lot of the roads are very hard to drive, through mountain passes we were sometimes brought to a 20 Km/H crawl. Keep the gas tank full. If you're embarking on a long drive (say from Tilcara to Cachi like we did in one long day), fill your tank before you leave town. There are long stretches between a lot of the cities and you may not see a gas station for quite a while. Bring toilet paper. I found the probability of TP in public bathrooms to be about a 50/50 shot, so just keep a pack of tissues in your bag, you're welcome. Know how to change a tire. There's a huge chance you'll pop a tire. Everyone joked about it before we left. I felt that cocky "it'll never happen to me" attitude everyone gets before it happens to them. We popped a tire. Check your rental's spare when you pick up the car, there's a big chance you'll need it. You can bring the deflated tire to a tire shop (gomeria) in the next town you visit for a quick patch (parche). We flew into and out of the city of Salta. I chose to hit the ground running and save the city for our last day. This also gave us some lee-way on getting back into town and to the airport should any car trouble cause delays in our trip. We took the first flight out of Buenos Aires, landing at 10 am. We got our car and hit the road to Jujuy. The drive from Salta to Jujuy was very green and lush. I had this image in my head Salta being part of a large desert and didn't expect this green forest! We took the old Ruta 9 and it was a challenging drive. The road isn't wide enough for one car to fit comfortably in its lane. There are also countless hairpin turns (a recurring theme for this trip). We came across cows, goats and one large pig just chilling on the road more than once, so going slow was a must. But why rush? The views were gorgeous and worth taking your time. It took us about 5-6 hours, but we stopped twice on the way, for lunch and for a look around Purmamarca. We spent 3 nights in Tilcara, exploring Jujuy. We chose Tilcara as our base for Jujuy. It's a larger city (as in, the largest of the small villages). It didn't feel as touristy as Purmamarca, as there were a lot of locals living here. We stayed at an amazing Airbnb. It had a panoramic view of the town and the best balcony in town to watch the sunset over the nearby mountains. Jujuy is a bit of the forgotten stepchild compared to Salta. So much so, that I didn't even consider flying into Jujuy and just booked our flight to Salta (even knowing I wanted to visit Jujuy!). Salta (known as Salta la Linda), is a much stronger province and has a lot more wealth than Jujuy. Which must explain the amazing PR Salta has, commercials air on local TV all the time that tempt me to buy a ticket to Salta for the weekend. Jujuy, however, is equally beautiful and very different than Salta. It deserves time, we only had three days in Jujuy, but 5 or 6 would have been ideal. 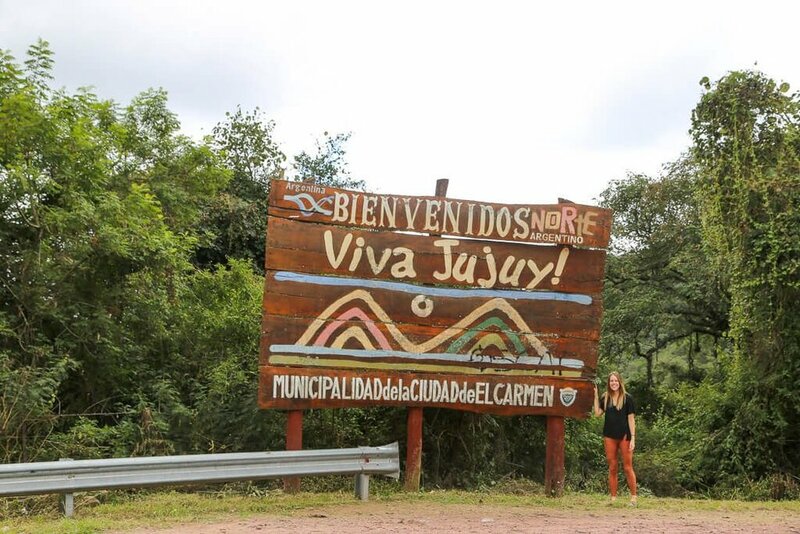 Want to know more about what we did in Jujuy? With 3 days in Tilcara, we were able to explore quite a bit. We spent one day driving north to Humahuaca to see the 14 colored mountain (well worth the drive! ), stopping in Uquia along the way for a hike to the Cerro de las 3 Señoras. The next day we visited the smaller towns of Maimara and Purmamarca. On our third and final day, we drove our next destination: Cachi (with a pit stop at the Salt Flats). If you have a few more days, I recommend adding Iruya to this itinerary (it would fit in easily after visiting Humahauca). It's a small village that's further north from Humahuaca in the mountains. Often described as being perched on the cliffs, I hear it's one of the highlights of the region. Unfortunately, we didn't have the time to see Iruya. The drive to Iruya is difficult and long. Going for a day isn't recommended. Go for at least two nights to really experience it. Then let me know how it went, I'm still dying to go! This day was our longest day, I vastly underestimated the time it would take to drive to Cachi from Tilcara. We started the day by leaving at 7 am to visit the Salt Flats. It took us about two and a half hours to get there (taking Hwy 52, passing Purmamarca). The road was paved but there were a lot of hairpin turns that slowed us down quite a bit. But I repeat, why rush? The views, enjoy the views!! 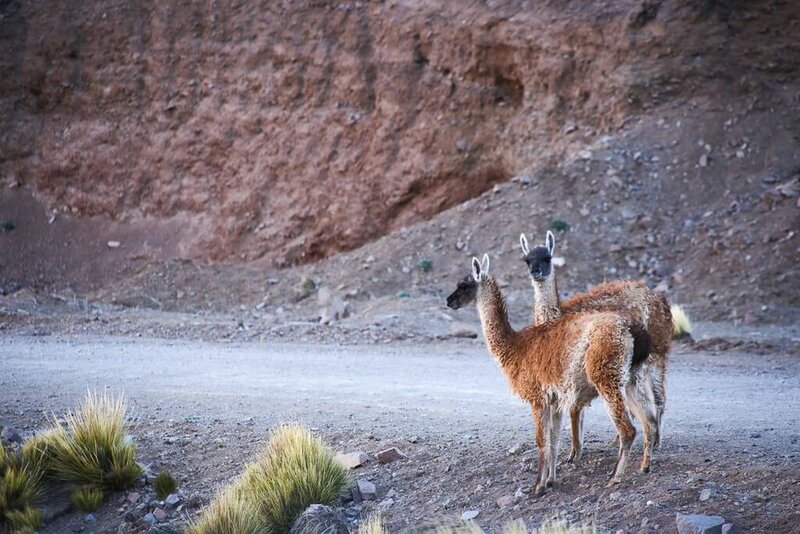 The change in scenery from the mountain pass to the altiplano plains that surround the Salt Flats is drastic. We were like little kids seeing the white sea loom ahead, anxious to arrive. We spent about an hour and a half there, playing with perspective and taking fun photos. Then we took the tour to drive to towards the center of the Salt Flats. At around the equivalent of $10 US, why not? A local guide hops in your car with you and gives you the history of the region and all the details about salt you could ever need. Cousins of the camel, you're sure to see all three of these very different but very similar animals near the salt flats. How to tell the difference? Check out the following three pictures out to help you out. Llamas are the biggest and have the most unkempt fur. Vicuñas are the daintiest, being slightly smaller, have slim necks, and very fine fur. Guanacos are similar in size to the vicuña, but darker in color. They're dark brown with black faces. You won't find Alpacas here. They were brought down by the Incas when they conquered the region, but not being native to the region, they died out. Stretching across the entire country from north to south, the Ruta 40 is an infamous stretch of highway here in Argentina. So I was very excited to drive part of it from the Salt Flats to Cachi. Intersecting with the Ruta 52 at the Salt Flats, it seemed like an obvious route to take. It's a dirt road, or as it's called here: ripio. It was my vocabulary lesson of the trip, we drove a lot of roads that were "de ripio" and it was quite the challenge! The picture above was at a particularly good stretch of road. Arriving in San Antonio, nearly 2 hours later, we saw an ominous sign: the road up ahead was under construction. There were large tracks of road that was just sand. Soft, deep sand. It was like trying to drive a sad little car with a weak engine across the softest beach you've ever seen. Not. Easy. But we made it, to what felt like a deserted town! San Antonio de los Cobres is what most mining towns seem to become, impoverished. It felt abandoned, despite being a living town. We arrived late and all the restaurants were closed, but a kind man opened his restaurant for us. Bellies full of his delicious food and ears full of his very useful advice for the road ahead, we took off again. Before leaving, he filled my thermos with hot water and gave me coca tea for the high altitude. This man was my savior. I expected San Antonio to have more action because it's home to the famous Tren de los Nubes. 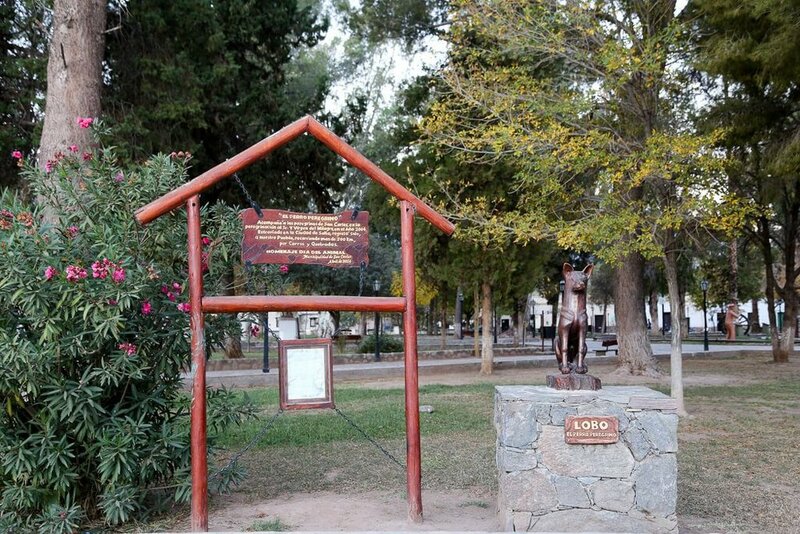 This is one of the most popular tourist attractions in Salta. The train used to depart directly from Salta, and you'd spend the entire day on a rather slow train, finally reaching the stunning vistas it's famous for. Now, a bus picks you up in Salta (and is actually faster and more efficient than the previous train), and you board the actual Tren de los Nubes here in San Antonio. I decided to skip it. If you’re driving through Jujuy, you’ll see plenty of gorgeous views, you don’t need to take an old, rickety train to see more (personal opinion). From here, Martin took over the wheel. From the sound of it, we had a rough drive ahead and I didn't want any part of it. We would be crossing the Abra del Acay mountain pass and we'd just found out we still had 4-5 hours of driving ahead, SURPRISE! We continued on Ruta 40, over the mountains. It was the scariest drive of the trip, but also the most rewarding. 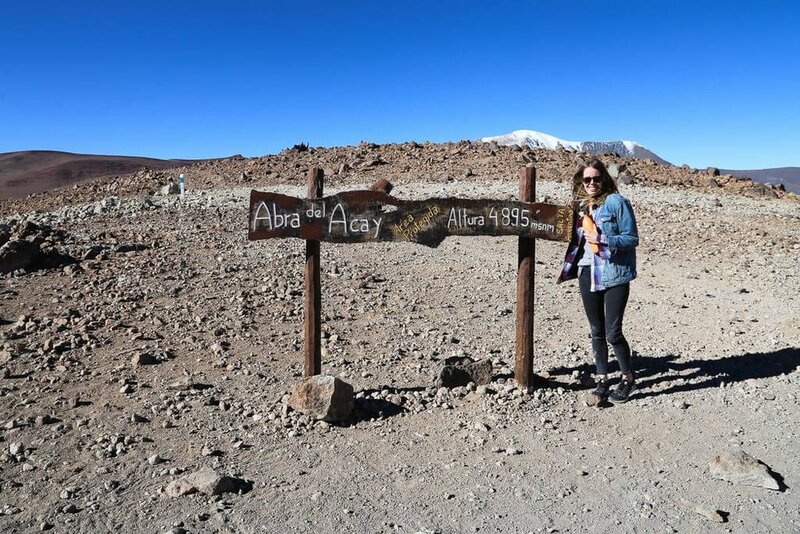 The views were incredible, we reached nearly 5,000 meters in altitude, and we saw guanacos! There is an alternate route: If you're not feeling this mountain pass. 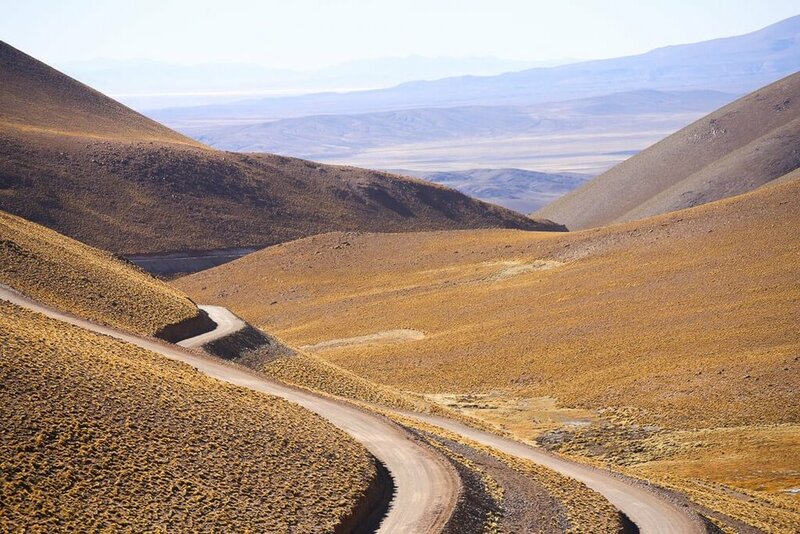 Take the paved highway 51 back to Salta. 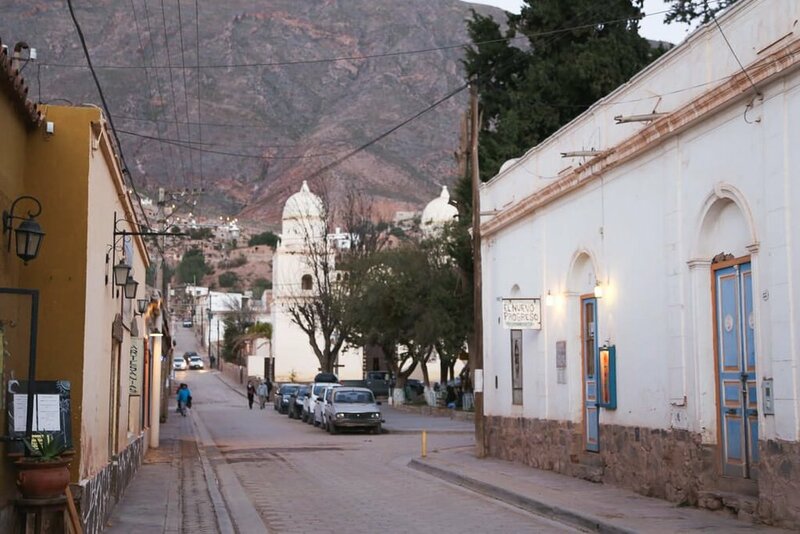 Ideally, spend the night in Salta and then drive to Cachi the following day. If it's raining or has snowed, this will be your only option. Clutching that thermos of coca tea like my life depends on it. Leaving the Abra del Acay behind, we reached a valley. The color of the earth changed from green to red as we drove along the Rio Calchaqui towards Cachi. What impressed me so much about this region was how quickly the landscape would change. 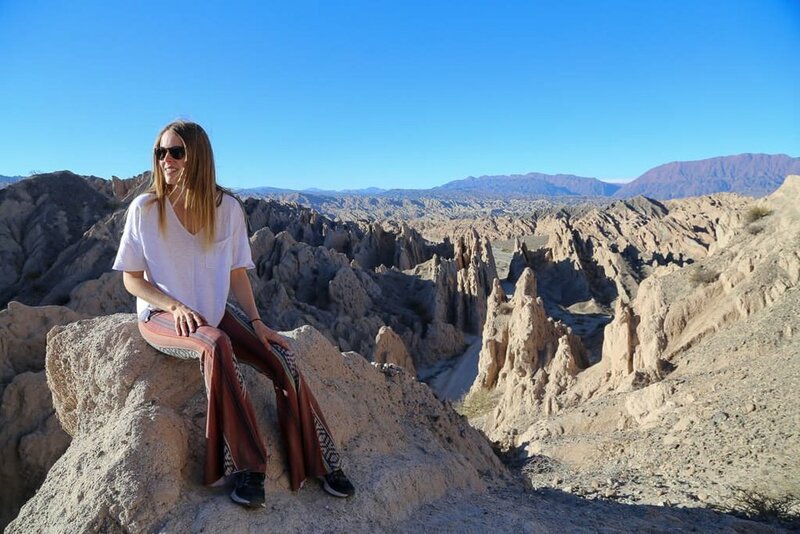 In one day we'd seen the colorful mountains of Jujuy, white expansive salt flats, the plains of the Altiplano, green mountains, and the deep red valley of the Rio Calchaqui. The sunset long before we finally arrived back "in civilization." Pulling into a police check in Payogasta, the first town we'd seen since San Antonio, we started to hear an odd sound. The police had us roll our window down and cracked a joke about how they heard us before they saw us, "rough drive?" Yep, the tire was completely deflated. How we made it this far before getting a flat is beyond me and a blessing. We were lucky to be able to change it on a shoulder with the flashlights of the police, rather than on the edge of a cliff on the mountains! Always find the silver lining. Tire changed, we dragged our sore and tire bones to final few miles to Cachi. Unfortunately, we only had time for the one night in Cachi. You could easily spend 3 days in Cachi. 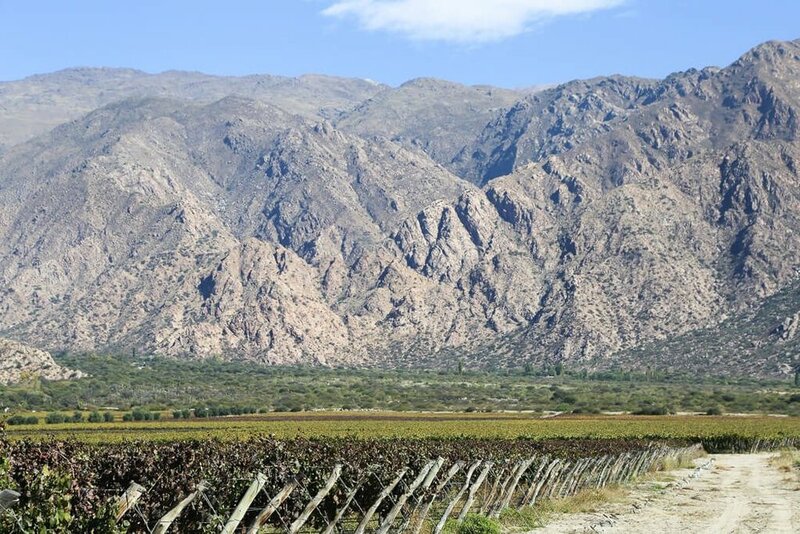 This is where the Salta Wine Route begins, stretching all the way to Cafayate. We spent the morning relaxing in Cachi while our tire was being patched up. This slow start to the day was just what the doctor ordered after our marathon of a day the day before. We finally rolled out of town at around 11 am, excited for another day of beautiful vistas. We spent our one night in Cachi at the Hosteria Villa Cardon. My only regret is that we only had the one night. I'd love to come back for at least three days to really enjoy the area and the hotel. It was SO comfortable. The traditional adobe structure was cozy and warm. Breakfast was delicious and the woman who was working that night and the following morning was extremely friendly. Check rates here. There are a few cute towns and wineries to stop at along the way, but we couldn't due to our late start. We drove through until our stomachs wouldn't let us go further. We pulled off the trusty Ruta 40 into the town of Molinos in search of empanadas. If you're looking for a pit stop, look no further than El Rancho de Manolo, just a block from the main square. We ordered a plate full of empanadas, a humita en chala (like a tamale made out of sweet corn and cheese), and a salad for good measure. I'm hungry just thinking about it. While in Molinos, check out the church and the historical colonial home in front of the church. While we're at it, let's just make it a rule that you visit every church in every small town you visit in Jujuy and Salta. They were all beautiful, some dating as far back as the 1600's. Many are decorated with wood from the regional cactus. Do yourself a favor, because you haven't seen churches like these, I promise. If you have the time, also visit Colome. It's a renowned winery near Molinos. We, unfortunately, didn't have the time. Bellies full, we returned to the Ruta 40 towards Cafayate. After passing the town of Angastaco, the landscape changed abruptly from Earth to the Moon. The Quebrada de las Flechas is a geographic formation that lasts for about 20 kilometers of highway and you'll feel unsure of exactly what planet you're on. We pulled over at every viewpoint to take in the views. I had never seen anything like this before! I really appreciated the signs that attribute Pachamama (Mother Earth) as the author of this masterpiece. Stop at the Ventisquero (Wind Tunnel) view point, seen below. There's a short trail leading you up one of the formations for a panoramic view of the entire quebrada. We brought alfajores for a snack at the top, never has a snack had a more beautiful view. We had to pass by more wineries than I'd have liked (because ideally, I'd never pass a winery by), but we made the time for a quick visit to San Carlos. Worth it. Another cute town, another beautiful church. There's a small antiquities museum with Pre-Colombian artifacts, just on the corner of the main square. Next door to the museum is a cooperative shop selling local artisans work. Shop for all of your souvenirs at these "cooperativas." They sell work directly from the artisans themselves, so you know your money is going to the right place. The quality is also much higher. Be sure to check out the statue of a dog in the main square just across the street from the church. He followed the villagers to the city of Salta on a pilgrimage and got lost there. But not for long, he found his way home to San Carlos (a real-life Homeward Bound!). After two long days on the road, three nights in Cafayate was just what we needed. Saving this wine paradise for the last half of the trip was the right decision. We spent our time eating and tasting the regions local delicacy: refreshing Torrontes wine. The wineries here are less strict than in Mendoza. None required reservations and most could give us a tour and tasting whenever we just happened to show up. The tastings were also free, a happy surprise. We did get off our laurels one morning for a three hour guided hike to the waterfalls. I fell into the river, badly bruised my leg, and happily decided to stick with wine for the rest of this particular trip. Want our full wine tasting itinerary? We stayed in town at the Villa Vicuña Boutique Hotel. I can't say enough good things about this hotel. The location is ideal, steps from the main square. The wineries are all located in town or nearby, so many are also walking distance from Villa Vicuña. The colonial style building is gorgeous, with a wonderful dining room for the buffet breakfast and beautiful patio to relax in after a long day of wine-tasting. The people who worked there were very helpful, answering all of our questions, and the room itself was very comfortable. I highly recommend it. For your stay, check rates here. Saturday morning came and it was time for us to leave Cafayate. I would have been happy with another day or two there but all good things must come to an end. At least we had another beautiful drive ahead of us. And can I just say how happy we were to be driving on pavement again! Highway 68 was a pleasure to drive after two days of the dirt and rocks of Ruta 40. This drive took us about 6-7 hours but we stopped a lot (a lot), including a long lunch stop. The drive from Cafayate to Salta is one I've heard about for years. And no wonder, what a beauty! The Quebrada de las Conchas is one for the books. If you happen to have more time in Cafayate, you can explore the Quebrada with a bike (most hotels, hostels and tourist agencies rent them by the hour). Lacking the time, we explored by car on our way to Salta. The dirt is a deep red and the mountains offer stunning formations. Lots of pit stops were made and our jaws dropped nearly every time we turned a corner. I knew we were getting close to the city of Salta when the red dirt disappeared and the lush, green vegetation took over. It surprised me how quickly the topography changed. Red desert to lush forest, it happened so quickly I didn't notice it happen until we were surrounded by green. Reluctantly we were leaving nature behind and arriving in the city for our last night. It was disappointing to return to a city (albeit a small one) after being in such beautiful natural landscapes all week. But at least Salta is a beautiful city. We had one night and the following day to explore for our Sunday night flight back to Buenos Aires. And to be honest, you don't need any more time than this to see Salta. We were able to see all the highlights at a relaxed pace and with time left over. My main advice is if you're tight on time, save that time for the towns like Cachi, Cafayate or the villages of Jujuy. Allow a full day to see the Archeological Museum, the two main churches and to take the funicular up Cerro San Bernardo. It's all you need. I wish I had nice things to say about our hotel in Salta. Sadly, it was a horrible experience. The windows in the bathroom didn't close properly (even with maintenance trying). Our room and the room next door shared a window, which meant the wall between rooms couldn't be built completely. The rooms were separated by an aluminum strip between where the wall ended and the window. So we could hear every. single. thing our neighbors said, and I'm sure it was mutual. So, don't stay at Hotel Brizos. I recommend you reserve a room at the Villa Vicuña Boutique Hotel. It's the same hotel as the one we stayed at in Cafayate. I tried to reserve a room here as well, but it was fully booked. My parents stayed here when they visited Salta and had a great experience. My other advice would be to look for hotels on the blocks between the Plaza 9 de Julio and Cerro San Bernardo. This area was the most beautiful and conveniently located to things you want to see. These 9 days in Salta and Jujuy were the best trip I've ever had in Argentina (so far). I was blown away by this area of the country. It's unlike no other part of Argentina, and actually, closer resembles Bolivia in landscape and culture. The people were friendly, the food was delicious, and the wine was free-flowing. I will be back.